The AMAC Demo Truck is available to provide a close look at many of our products. The 3/4 ton "Sprinter" panel van is displayed for easy walk-up viewing of equipment from several manufacturers. In your yard or garage, we can simulate operation and set-up of most products. Our capabilities extend far beyond just a simple demo. We can showcase our high-end reel trailers and other cable installation tools and gear on-site if needed. Many of our clients require a reel trailer for their cable pulling and removal operations. We offer a standardized and effective demo and testing service that allows you to experience the effectiveness of our equipment firsthand. 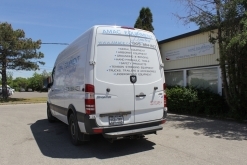 The Demo Truck is staffed by highly experienced and skilled teams of technicians and customer service professionals who can cater perfectly to the needs of different clients. Regardless of the type of demonstration you require, you can be sure that the AMAC Demo Truck will be there to showcase our products and services on time and well. All of our demonstrations are done in conjunction with a customer's existing equipment and crews, best demonstrating what actual operation would be like at your location. One of the most attractive aspects of our demo truck and the personnel who accompany it is that we can provide test runs of effective and efficient tool use. 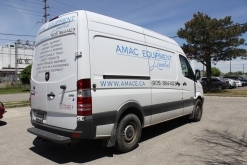 This includes the proper safety procedures when operating the equipment we supply, proper storage of tools and accessories when not in use, as well as useful tips and tricks for efficient, cost-friendly operation of all the resources available upon request from AMAC Equipment.